Giving your boyfriend the perfect cute romantic gift is possible through various methods depending on his interests, hobbies, and your own creativity. Finding the ideal romantic gift is not limited to store-bought items, as you can also get creative with your own handmade presents to add your own personal touch. 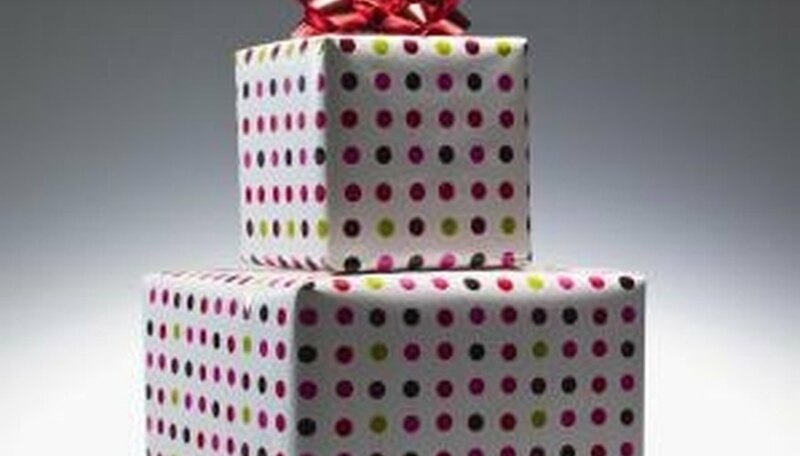 A cute gift may be a gift that is thoughtful and has meaning to your boyfriend, and is also decorative.You may know your boyfriend nearly better than anyone in his life, which means you have even more options when decorating and incorporating the things he enjoys most in life with your gift. Romantic gifts for your boyfriend can range from simple crafts to creatively filled baskets. Purchase a blank picture frame, often sold at craft stores as blank wooden or plastic frames. Purchase paint colors that are your boyfriend's favorites. Paint cute nicknames you and your boyfriend have for one another on the frame, along with other quotes, jokes, or favorite phrases between the two of you. You can also purchase letter stencils for precision when painting words or thoughts on the frame. Add a photo of the two of you that is recent or from when you began dating. You can also add the date to the frame of when you began officially dating one another. Create and design your own scrapbook to give to your boyfriend with memories of your time spent together as a couple. Purchase various themed scrapbook paper and thicker card stock to place within your album before inserting your photos. You can create your own scrapbook album by using colored card stock or cardboard, or simply purchasing a blank pre-made album from a local craft store or online. Place your photos of the two of you as a couple within the scrapbook in chronological order or in random order depending on your book's overall theme. Additional decorations for scrapbooks include themed stickers, stencils, and even stamps--which can all add pizazz and color to your scrapbook gift. Give your boyfriend the ultimate customized gift basket to fit all of his needs and interests.You can choose a specific theme to stick to when designing a custom gift basket for your boyfriend, such as sports, daily necessities, or even an entire media themed basket. You can also mix and match various store-bought gifts as well as handmade crafts inside the basket. CDs, download gift cards, and even movie tickets make for ideal gifts to suit a media themed basket. Purchase cologne, shaving gel, deodorant, or new shoes to add to a basket full of necessities. Fill the gift basket with a variety of gift ideas you gather from all of his hobbies and interests to help ease the decision making when deciding on the gift basket's contents throughout. Purchase an empty blank wooden craft chest in the shape and size you desire from a local craft store or a craft outlet online. Purchase paints along with scrapbook stickers that fit your boyfriend's favorites and personality (such as sports, travelling, or even music). Paint each side of the chest a different favorite color of your boyfriend's, or stick with a color scheme that reminds you of him. Once the painting of the outside of your chest is complete, you can then decorate it using letter stencils and themed stickers. Insert photos of the two of you together, along with any special notes, cards, and items that remind you of him. You can also write a thoughtful message or a poem to insert into the craft chest as well. Bee, Alexandra. "Cute Romantic Gifts for Him." Dating Tips - Match.com, https://datingtips.match.com/cute-romantic-gifts-him-8041796.html. Accessed 21 April 2019.